I have recently updated the Summer Art Show printable and I thought you might like to have it in your files to use with your family. It really doesn’t have much to do with summer art but rather we completed the activities during the summer of 2012. The theme of the art activities centers on the Impressionists which is applicable at any time of the year. I hope you enjoy taking a closer look at a few paintings with your family. Here is a link to the Summer Art Pinterest Board that has links to many of the paintings we have studied in the past. Last summer I did a Summer Art Show with lots of fun activities and printables. You can find all the paintings and notebooking pages on my Summer Art Show Pinterest Board. I have been scheming up something for this summer as well. I am thinking it might be fun to give you some ideas for art projects each week starting June 18, 2013. Then we would handle it just like Sketch Tuesday where you send in your artwork images for a slideshow the next week. I have some fun ideas for you to try and you can participate as much or as little as you like. All summer long we have been viewing artwork on the Summer Art Pinterest board. Our family enjoyed having a relaxed study of some of our favorite artists and then having a quick and easy follow up notebook activity to help us glean more from our viewing. I gathered all the summer art printables into a set and added a couple of artist biography pages to make it more complete. 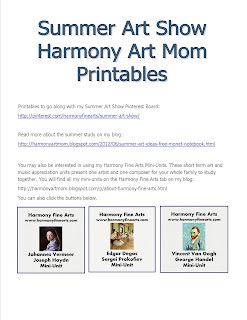 The Summer Art Show Printables download is ready for you to save for future use in your family. Enjoy! Make sure to follow the Summer Art Show Pinterest board for any updates. You can read more about how to use the Summer Art Show and the Printables here in this entry:Summer Art Ideas.